We know that cats are the masters of hiding pain. Once you learn the subtle signs (here’s my article on how to decode these signs of pain) your next thought is – what can I do to help? A trip to the vet is always a great idea! Finding out if there is a major systemic disease, and treating it, can do the most to help your cat feel better. But what if your cat is otherwise healthy, but has arthritis, or stiff joints? What if your cat has major illness along with some soreness? Yes, your veterinarian can prescribe pain-relieving medications, but I’ve learned it’s the every day things that have the greatest impact on how these cats feel at home. Here are six modifications you can do at home that will make a huge difference in your cat’s quality of life. Your cats favorite spot might have been great when he was young, but older arthritic cats require more cushioning. Think about how as a kid you went to sleepovers and camp-outs and slept on the floor just fine. No way would you do that as you get older! As cats age, they need thicker padding for bedding. Often cats lose weight as they become geriatric, and bony prominences can hurt when on a thin blanket. Careful – don’t make it too thick! It then can become too tall for a cat to comfortably climb. So consider both ends of the problem when looking for bedding. An extra half inch can make a world of difference! Speaking of difficulty climbing tall things, how tall are the edges of your litter box? Senior cats need a low ledge to easily enter and exit the litter box. Yes, litter might travel out of the box. Sweeping it up is minor. Let your cat have easy access to the box, and he’s less likely to find other places to eliminate! Also, consider the location of the litter box. Your cat shouldn’t have to walk down an entire flight of stairs every time she has to go. If you had to walk down a long flight of stairs, then scale a wall as tall as your head just to pee, you’d be looking for an easier place to go as well! Keep the litter box on the main floor, and in easy reach of the area your cat spends most of his time. OK, I just said the litter box needs a low ledge so your cat can step in and out with less pain. The opposite is true for food and water bowls. If a cat has shoulder, elbow, or neck pain, imagine how painful crouching down to lick a plate or drink some water from the floor can be! Slightly elevating the food and water bowl to a more ergonomic position can let your cat eat and drink more comfortably. It may take some trial and error to find out which height is most comfortable for your cat. He shouldn’t have to lift his head up to access food and water, just be able to maintain a more normal standing posture. Finally, have the food and water in a location that is easily accessible, yet obviously not too close to the litter box. Favorite perches – reachable again! Is your cat not perching to guard her domain like she used to? Not jumping to get to her usual spots? It probably hurts, or is difficult to jump, but she sure would love to be up there! Instead of one big jump, add some in between levels, allowing her to jump a short distance each time. I have owners who even have bought or made pet staircases leading up to window sills, beds, or couches. And remember, going up is not always the challenge – jumping down can be as well. Jumping down puts a lot of pressure on the front limbs, and also requires significant flexibility along the spinal vertebrae. So consider both directions when placing the additional levels or steps. Additionally, make sure the perch is stable and not wobbly at all. Any movement makes a cat have to tense up to regain balance. Related to this, a good non-slick surface in the area your cat wants to jump may give him more confidence in trying to make these smaller jumps you’ve just offered. Rubber-backed rugs, or even yoga mats, work well here. Most cats are vertical scratchers, and crave a scratching post that is tall enough for them to stretch out and really scratch it good! Some cats are horizontal scratchers, meaning they want a flat surface, yet long enough to stretch. As cats age and develop arthritis, it may become painful for them to stand on their hind legs and scratch vertically. If your cat is no longer using her post, try a horizontal one. She might love it! Or, she might roll her eyes and wonder what got into you. She is a cat after all. There are many conditions that can cause a cat to lose her vision as she ages. Hyperthyroidism and kidney failure can both cause hypertension (high blood pressure). Cats with hypertension will often become acutely blind, as the retina (the part of the eye that processes light) will detach and no longer function. Many people cannot tell their cat is visually impaired until they do something like move the furniture. Cats can memorize the house and fake it pretty well, but with a new layout, they start bumping into things. Cats hate not knowing where they are, so many will just avoid walking around altogether. For this reason, keeping furniture and rugs consistent in the house will help your older cat know where she is and not feel confused. 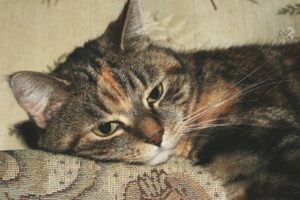 Furthermore, geriatric cats often develop dementia (here’s my article on feline dementia), similar to Alzheimers disease in people. Having a known floorplan and no surprises can make these cats feel much less anxious, and give them more confidence to move about the house. Many of these small things will bring about huge improvement in your cat’s quality of life. And the good news – nothing here is expensive! So go ahead and try implementing some or all of these changes. You have nothing to lose, and your cat will love you even more!